Video footage shows that Van Fleet had a green light before he was struck by Chor's OPD vehicle. 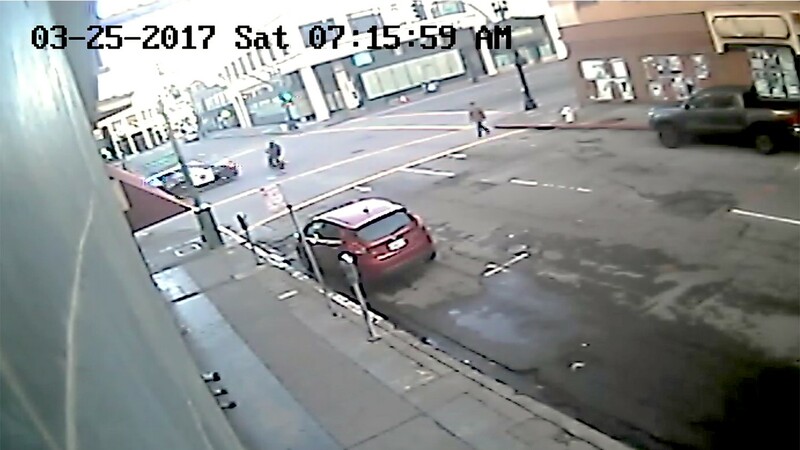 In the morning of March 25, 2017, Elliott Van Fleet was riding his motorcycle westbound on 19th Street in Uptown Oakland. He was wearing a helmet and obeying all laws. He was heading toward Broadway, and the light was green. It was a day like any other, but everything for the 34-year-old Oakland resident was about to turn upside down. As he crossed into the intersection of 19th and Broadway, an Oakland police SUV, its siren and lights flashing, sped through a red light heading northbound. The police car T-boned Van Fleet and his motorcycle, pinning him against the front of the SUV before flinging his body off the hood. His bike tumbled onto the sidewalk where Van Fleet also landed, his upper-torso dangling off the curb in a painful contortion. It could easily have been a fatal wreck. The crash occurred just two weeks before Van Fleet's planned wedding. But Van Fleet, who remained conscious and remarkably calm throughout the incident, survived, although he was seriously injured. Van Fleet has sustained millions of dollars in medical bills, including for the amputation of his left leg, multiple surgeries, and physical therapy. He is also suffering from post-traumatic stress. As the Express previously reported, in June, the city of Oakland agreed to pay Van Fleet $12 million to settle a lawsuit he brought against the police department. The money will just about cover his medical expenses. In his lawsuit, Van Fleet alleged that an OPD officer, who he and his attorneys were unable to identify at the time they filed the case, ran the red light on Broadway, in violation of the law and OPD's driving policies, which require officers to fully stop at red lights, even when they're responding to emergency calls. But in settling the case, the city of Oakland admitted no fault or wrongdoing. However, newly obtained body camera video from Police Officer Danny Sy Chor, who caused the collision, and surveillance video from a nearby building indicate that Officer Chor not only ran a red light, but that he also appears to have made several false statements in an attempt to exonerate himself. However, Chor remains on the police force and is still driving OPD vehicles. And as Van Fleet lay bleeding and temporarily paralyzed on the sidewalk, Chor argued with him, even lecturing Van Fleet that the accident was his fault because he wasn't careful enough. In June, the Express filed a California Public Records Act request for documents related to the accident, but Oakland police and the city attorney declined to make any information about the case public. Van Fleet and his attorneys ultimately provided to the Express records of the incident, including footage of the crash. OPD also has yet to answer questions about whether Chor was investigated or disciplined for apparently making false statements. But in an email to the Express, OPD spokesperson Johnna Watson wrote, "Officer Chor is assigned to patrol and is operating a patrol vehicle." Some of the footage of the crash came from a camera that was mounted on the 19th Street side of the Oaksterdam University building located on the southeast corner of the intersection. In the video from that camera, Van Fleet approaches Broadway with a green light clearly ahead of him. As he enters the intersection, with the light still green, there's virtually no sign of Chor's police vehicle. But then, suddenly, Chor's SUV speeds into the intersection, into the camera's frame, and hits Van Fleet dead on. There are several indications in the video that Chor ran the red light without stopping. For one, his SUV plows through the intersection at a high rate of speed. But the camera also recorded the reflection of Chor's police emergency lights in a plate glass window of the building located at 1901 Broadway, catty-corner to the camera's perspective. Chor's reflected lights appear and disappear quickly in the window, indicating that the officer was speeding northbound, before striking Van Fleet. In compliance with OPD policy, Chor activated his body camera when he got out and approached Van Fleet. "Better stay still, OK? You're going to be OK," Chor told Van Fleet as he stood over him minutes after the collision. Chor then proceeded to lecture Van Fleet about driving safety. "You got to be careful at the light, sir, OK? You didn't hear my siren? I stopped at the light." "No, I did hear your siren," replied Van Fleet. "But you were flying through. You were going so fast." "I stopped fully at the light, sir," maintained Chor. "You were going so fast." "Sir, I stopped fully at the light." After another Oakland police officer arrived, Chor again declared, "I stopped fully at the light." "You did not," said Van Fleet. "You just flew through it." "Sir, I don't want to argue right now, OK," Chor replied. A few minutes later, after several officers pulled Van Fleet fully onto the sidewalk and cut away his backpack, another officer asked Chor if he was OK, or if he was "shooken up." "Nah. I stopped fully right there, and kept going, cause I don't even have a skidmark or anything," Chor responded. OPD has yet to respond to a request from the Express for the data from Officer Chor's police vehicle, which would show if he did, in fact, stop before racing into the intersection. Chor did not respond to an email sent to his OPD address seeking an interview for this report. Oakland police have long had problems with vehicle crashes, including during pursuits and while responding to emergency calls in "code 3" mode, as Chor was doing. In 2011, OPD's Inspector General found that the department was "barely reporting half" of legally required data to the California Highway Patrol regarding pursuits its officers engaged in. Over 19 months studied by the OIG, Oakland police officers injured 21 bystanders, mostly pedestrians and other drivers who were hit by vehicles of fleeing suspects and police. In response, OPD changed its emergency driving policy to require officers to stop at all red lights and stop signs and obey all other rules of the road. "The policy required the police offer to come to a complete stop on Broadway because he had a red light," said Douglas Saeltzer, an attorney for Van Fleet. "But he ran it at a high speed.